All of us want to hear clear sound when listening to the music, watching movies and tv shows. If you are planning to buy new speakers and looking for a Bluetooth model that offers exceptional experience, this article is for you. 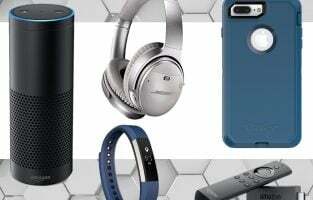 Here is a list of top best Bluetooth speakers to buy in 2019. Bluetooth speakers are becoming increasingly popular with each passing day for two reasons. One reason is that they are portable and is thus very easy for you to take it wherever you go. The other reason is their excellent sound clarity that makes listening to your favorite song or watching a movie a very memorable experience. 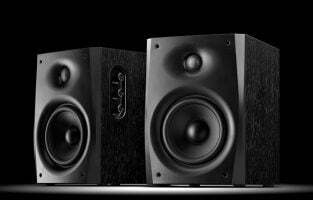 The sounds produced are usually without any distortion or disturbance even when you are not very near the speaker. Most Bluetooth speakers in the market are not very highly priced and compact, not taking up much space wherever you keep them. You can check the following list for some Bluetooth speakers if you are planning to buy one for yourself. 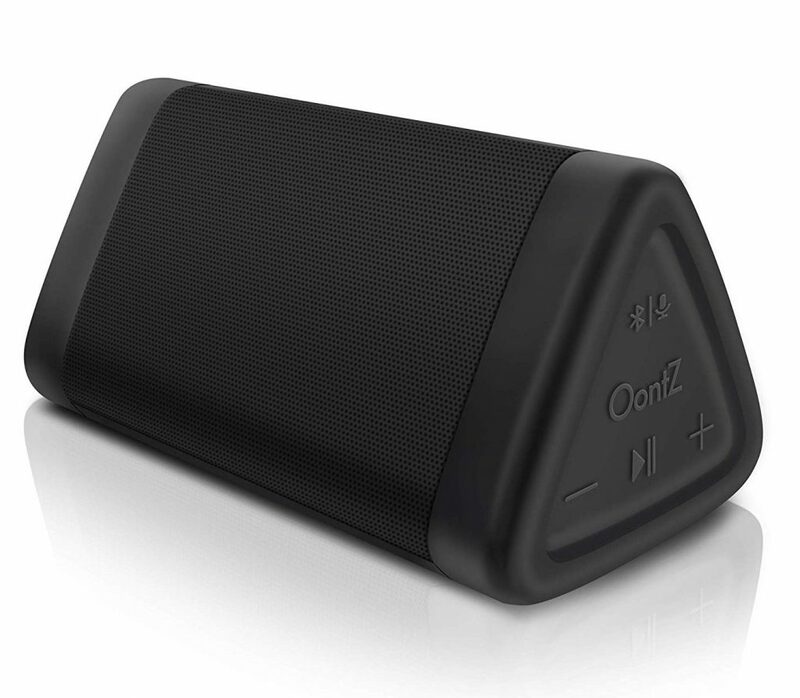 The Oontz Bluetooth speaker features an inbuilt microphone and a passive bass radiator design with two precision acoustic drivers that render superb and distinct high and mid sounds without distortion, up to a distance of 30 ft. A grille separates the stereo drivers to enhance the sound even at maximum volume. 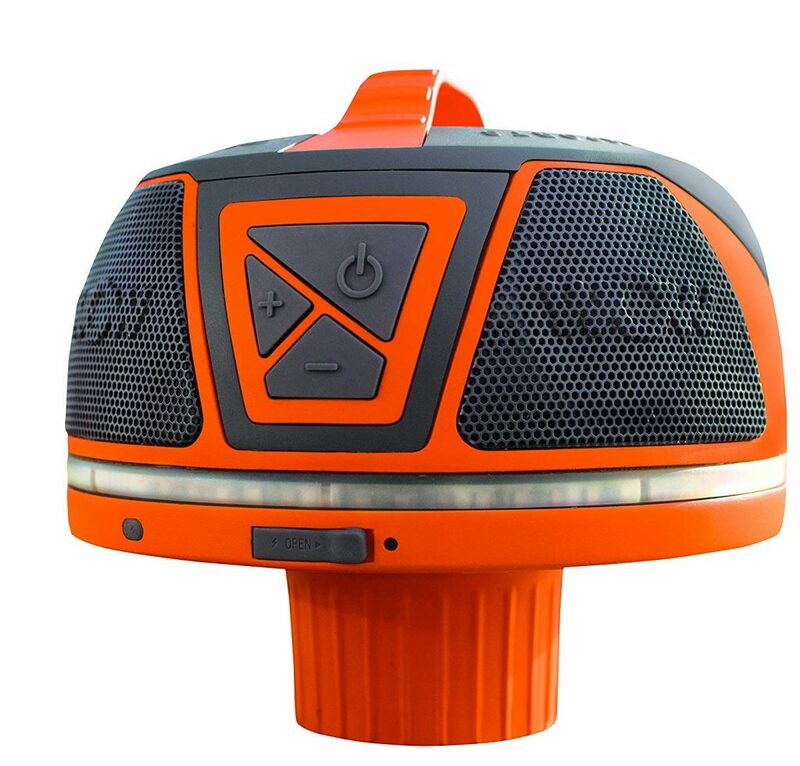 The ultra-lightweight speaker offers hands-free operation and is placeable both horizontally and the unit is rainproof, sandproof and splashproof. It is helpful in answering calls from a smartphone. The black colored unit has a triangular design with no hard corners that gives it a unique look. The Bluetooth speaker is compatible with Windows 7 and higher laptops, Chromebooks and almost all smartphones. It also works with non-Bluetooth speakers by establishing connectivity with the 3.5 mm audio cable provided along with it. The Bluetooth unit has a 2,200 mAh rechargeable battery that works for 12 hours straight when it is set to 2/3 of the full volume on a full charge. 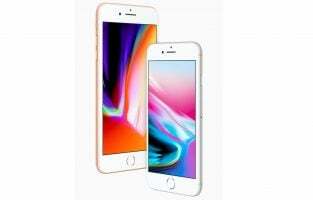 The Oontz Angle 3 makes a good bet for those who want to use it to perform various activities like watch movies, play games and listen to music for a long time without worrying about the battery being drained. 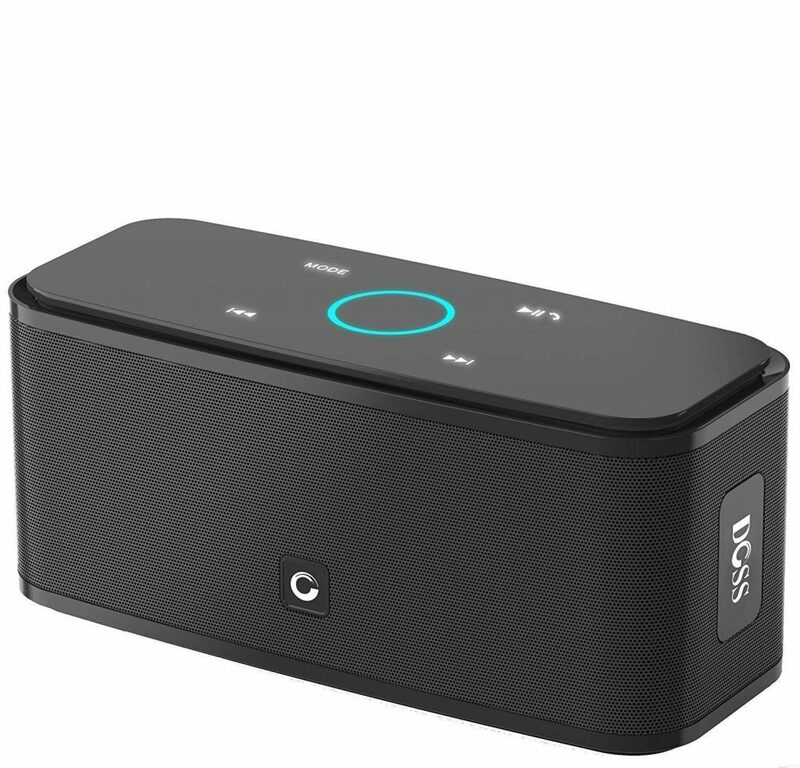 The Bluetooth speaker is a good option for gadget lovers as they can connect it to almost any device. The unit is the right choice for people for whom durability is of prime concern because of its IPX5 rating. This Bluetooth speaker has two high-sensitivity drivers along with a patented bass port and a built-in microphone that ensure zero distortion and supreme clarity. The speaker also includes a fine-tuned digital signal processor that produces deep lows and rousing highs with precision. The unit offers distortion-free performance up to a distance of 66 ft. It supports instant pairing with devices that are Bluetooth 4.0 compatible. 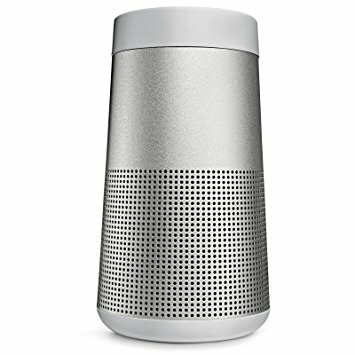 If Bluetooth is active in the last connected device, the speaker automatically reconnects with the same, to offer instant music playback. 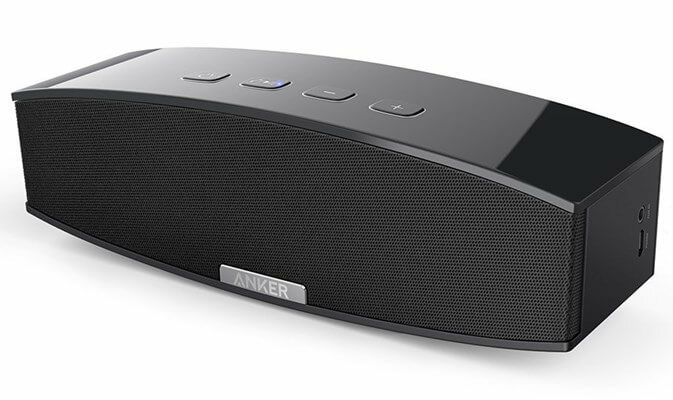 The drop-proof solid Anker Soundcore speaker is made of tactile materials and has seamless controls for easy operation. The rectangular unit is available in blue, red and black color variants. It is compatible with almost all tablets, phones and Bluetooth 4.0 enabled devices. The device also works with Alexa-enabled systems. It comes with a lithium-ion battery that allows the speaker to play non-stop for an entire day on full charge. The robust lightweight unibody makes the speaker worth considering by people who prefer a rugged device for daily use both at home and when on the move. The Bluetooth unit is a good choice for those who want to place their gadgets such as smartphones at a considerable distance from the speaker. A device is a great option for those who want to listen to loud and clear music all day long. The Doss Bluetooth speaker comes with enhanced bass and two high-performance drivers that allow you to enjoy music with utmost clarity in 12 W stereo sound effects. The portable speaker comprises an easy to operate style with sensitive touch buttons with laser carving finish and capacitive fingertip control for the track that is playing, adjusting its volume and other aspects. The touch button also allows you to choose from Bluetooth, Aux-In and Micro SD modes. The durable unit is capable of making and receiving calls from your smartphone. The speaker can connect with a Bluetooth device placed at a distance of 33 ft. from it. It is also capable of establishing automatic connectivity with the last connected device if its Bluetooth is turned on. The HD Bluetooth speaker comes in black, white, red and blue color options. When fully charged, the inbuilt lithium-ion battery ensures 12 hours of non-stop performance in 75% volume. The unit charges quickly in three to four hours with the micro USB cable that comes along with it. The HD support rendered by the Doss speaker makes it a must-have accessory for those who do not want any compromise in sound quality. The ultra-compact design ensures that the Bluetooth speaker is a good choice for people who want to take it with them wherever they go. 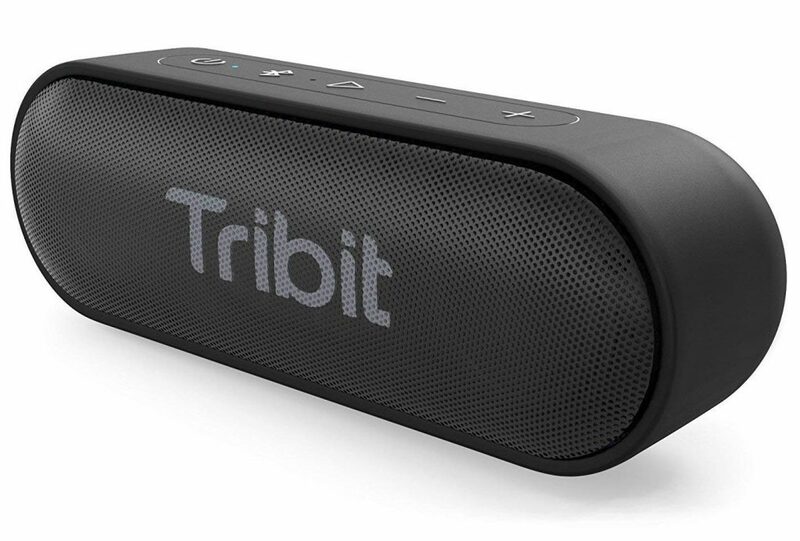 This Bluetooth speaker from Tribitwith built-in microphone assures you of the best listening experience, by offering deep smooth and rich bass, crisp mids and crystal highs with two 6W power drivers and top-notch passive bass radiators. The radiators and drivers produce high-quality sound without distortion even when you keep the volume at the maximum limit. The Bluetooth 4.2 wireless unit connects to other Bluetooth enabled devices at a maximum distance of 66 ft. It is also compatible with Echo and Echo Dot from Amazon. You can also use a 3.5 mm cable to connect the device to non-Bluetooth gadgets like TVs, MP3 players and PCs. The multifunction button allows you to access voice inputs for Apple’s Siri and Google Now. The matte finish and curved edges make the Bluetooth speaker look truly classy while the solid internal frame and tough exterior coating offer durability at the same time. The unit comes in two color options of black and blue. The IPX7 certified speaker comes with a powerful battery that keeps the device working all day long enabling you to listen to your favorite track at your convenient time. The XSound speaker is definitely worth buying by people who wish to use the same outdoors, as it is both dustproof and waterproof. 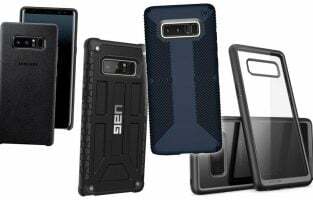 The rugged design makes it suitable for those who are apprehensive of their Bluetooth speaker being prone to wear and tear due to scratches. The passive subwoofer and 20W stereo sound speakers combination offer terrific amplification of both low and high bass frequencies resulting in clear, crisp and thumping audio. The IPX5 certified Bluetooth speaker is both waterproof and shockproof. It features an inbuilt screw mount mechanism so that you can attach the unit to a tripod. The aluminum grill components with a rubberized finish give the black and wood colored speaker a stylish appearance while ensuring ruggedness at the same time. 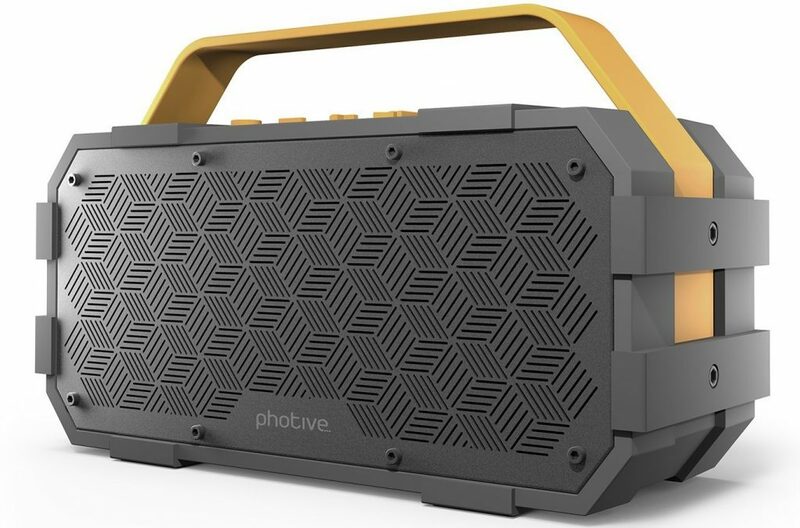 The rubber handle makes the Photive speaker look different from its counterparts. The 5,000 mAh powerful lithium-ion battery allows you to stream music non-stop for eight to ten hours. 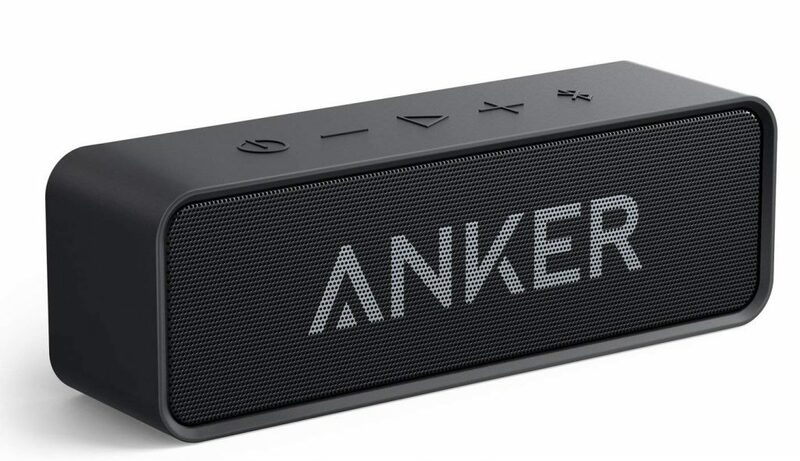 The Bluetooth speaker comes with a 3.5 mm Aux cable and a micro USB cable. This Bluetooth speaker is definitely the right bet for those who love partying both indoors and outdoors. The handle makes it suitable for those who are sceptical of dropping the unit when they hold it in their palms. The XLeader speaker has a compact circular design with a 3W 40 mm driver and a subwoofer resonator that delivers truly loud sound irrespective of what you use it for. 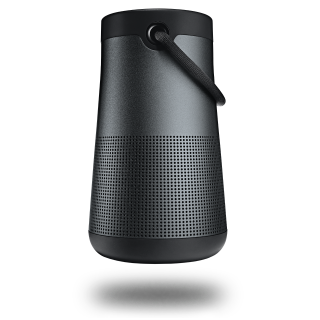 The Bluetooth 4.1 speaker features an Echo Dot design coupled with smart touchscreen technology that allows you to switch songs, answer calls and adjust the volume with just the touch of a finger. The LEDs make it easy to see the forward, rewind and volume control buttons that are located on top of the speaker, even in the dark. The device encompasses a slot for you to insert your music loaded Micro SD card. 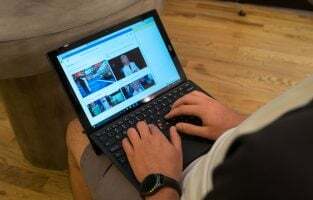 The device is compatible with any tablet; laptop or Bluetooth enabled system and established automatic reconnection with the last connected device in just a couple of seconds. The AUX cable included helps in establishing a connection with non-Bluetooth supported devices. The unique design speaker is available in rose gold, black, gold and silver color variants. The inbuilt lithium 1,000 mAh battery allows you to use the unit for 12 hours continuously when the volume level is set to 60%. This is about three times more than other portable speakers of the same size. The Bluetooth speaker takes just two to three hours to charge fully with the provided micro USB cable. The Bluetooth speaker is a good idea for those who want their device to sport a distinct look that makes it appear different from their counterparts. The LED display makes the XLeader unit worth thinking about by those who want to use a Bluetooth speaker at night or in the dark. The portable Bluetooth speaker has a unique design that fits inside a cup holder and comes with an inflatable float. The speaker has a high-class omnidirectional hi-fi 360-degree sound along with a 4” passive bypass and an LED light for night visibility. The 360-degree sound mechanism helps you hear the sound from the same clarity from wherever you are. The IP67 certified unit prevents sand, dirt and dust from entering it. The device is also waterproof and will not be damaged when immersed in water up to 1 m for close to half an hour. The TrueWireless Bluetooth function allows you to connect it to another speaker just like any other Bluetooth enabled device. The black and orange speaker has an average battery life for 50 hours that allows you to use the unit without any interruption throughout the weekend. The WOW-SOUND speaker is the ultimate option if you want to connect it to another similar speaker to experience booming stereo sound. The unit is given a rugged design to cater to the needs of people engaged in outdoor activities like camping, pool parties and watersports. The Bluetooth speaker utilizes a passive radiator and two drivers that deliver heavy bass and excellent 30W sound. The unit supports surround, party and classic modes that allow you to enjoy any form of music. You can connect it to another speaker at a maximum distance of 55 feet to enjoy 60W stereo sound. The device has an AUX input so that you can use it with other systems that support 3.5 mm jack connectivity. The Bluetooth 4.2 unit is capable of establishing connectivity with a mobile device at a distance of up to 66 feet. The speaker is made of pure cotton fabric and natural bamboo that makes it eco-friendly and has a smooth finish. The system comes in two color options of combination of black & brown and black & dark brown colors. It has a rechargeable lithium-ion battery that offers 10 hours of playback at mid-level volume. The speaker charges rapidly in a time span of three hours and serves as a mobile power bank for other systems. The AOMAIS Bluetooth speaker is the right choice for those who want to say NO to plastic and prefer eco-friendly materials for their unit. A device is a good option for those who are looking for an affordable system that matches their wooden furniture. The system is ideal for music lovers who enjoy pop, heavy metal and classic music styles. 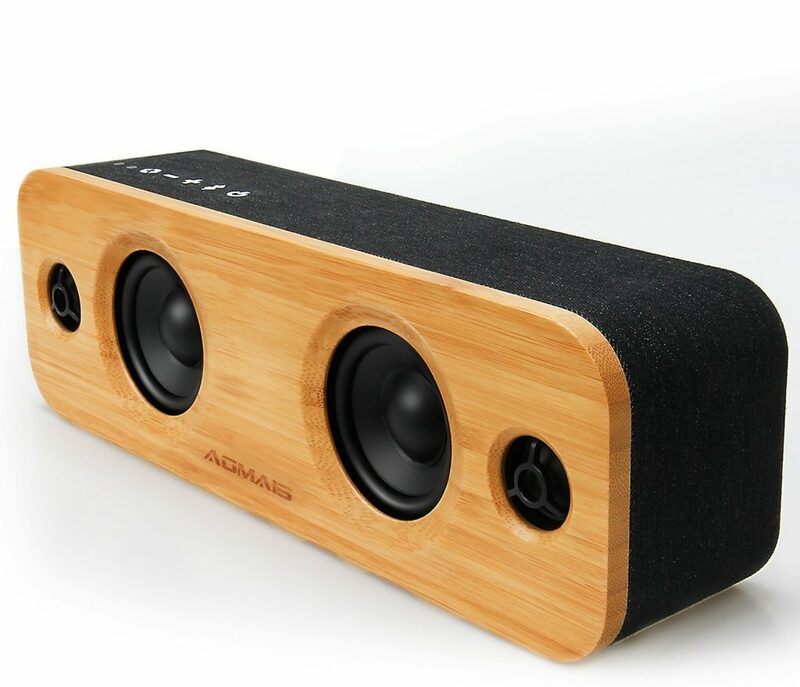 The Bluetooth system produces high stereo sound with its 2 x 4” hi-fi speakers along with volume, bass and treble controls for fine-tuning the EQ. The speaker is activated in pairing mode as soon as you turn it on so that it is ready to stream music. It connects with ease to any iPad, iPhone, Android or any Bluetooth supported device. The AUX audio cable provided along with the speaker also supports connectivity to devices that do not feature the Bluetooth connectivity option through the 3.5 mm input. The unit has a blue backlit LED light to enhance nighttime usage, an inbuilt charger to recharge your tablet or phone on the go and a handle for easy portability. The speaker is available in multiple color options of black, red, silver and purple. The USB recharge cable charges the long-lasting lithium-ion battery at a very fast rate. 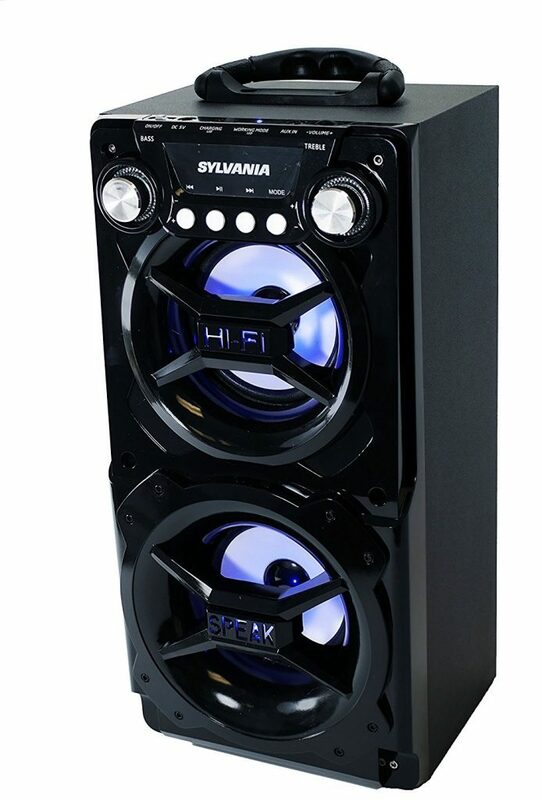 The Sylvania speaker is the best choice for those who want excellent sound at both high and low volume levels. The speaker is a great idea for those who find front positioned knobs easier to use than the top ones. 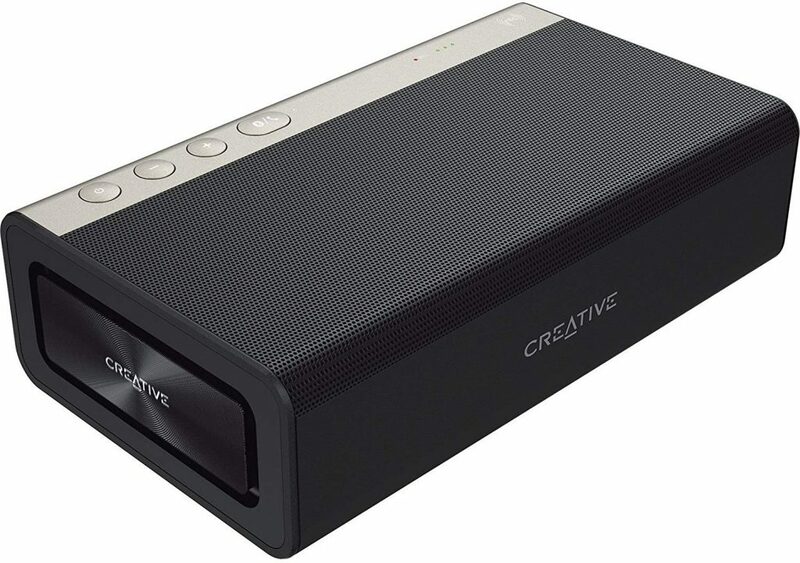 The Creative Bluetooth speaker renders superior quality sound with its five drivers including two high-frequency drivers, two passive radiators, a woofer and high-definition aptX and AAC codecs fitted in a palm-size enclosure. 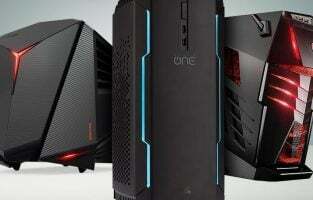 It also features various controls on the top, a USB sound blaster, a battery bank, a voice recorder, an inbuilt MP3 player and a provision to insert a micro SD card. You can place the device in either horizontal or vertical orientation for balanced and room-filling audio or more directed and loud audio. 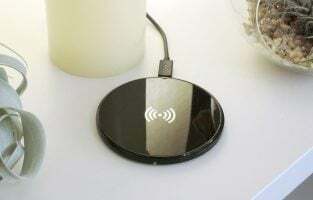 The speaker can establish a wireless Bluetooth or NFC connection with other units or a wired connection with non-Bluetooth devices using the AUX-in or USB cable. The unit is available in full black; black and silver color variants. It houses a Li-ion 6,000 mAh battery that guarantees unmatched performance for eight hours. A power adapter is provided along with the speaker to charge the battery. The Bluetooth speaker meets the requirements of people who want a portable unit, which renders excellent audio performance with high resolution but also has a stylish appearance. This speaker from Bose has a small build but powerful sound. The sound emitted from the speakers spreads evenly and has a uniform coverage. The speaker is portable and can be carried around just like your smartphone. You can play it for 12 continuous hours. The app of this speaker is pretty easy to use. You can use different modes depending on the mood. Switching between two Bluetooth devices on the app is pretty quick and effortless. 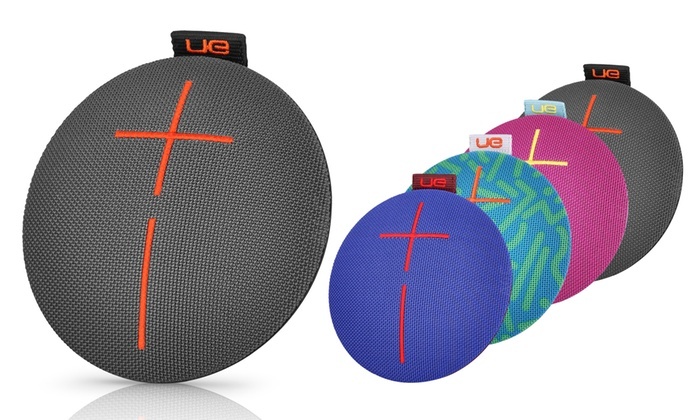 The next best Bluetooth speakers to buy in 2019 is UE ROLL 2. This cute wireless portable Bluetooth speaker is water-proof. It is IPX7 rated and will work perfectly fine even after it has taken a dip in the water up to 3 feet deep. You can pair it with up to 8 Bluetooth devices and it can have two sources connected at the same time. A smartphone will work with the speaker up to a range of 65 feet. You can also play by streaming online music on 2 UE ROLL speakers from a single source. Time taken to charge the battery is about 5.5 hours and it will usually last for up to 9 hours. 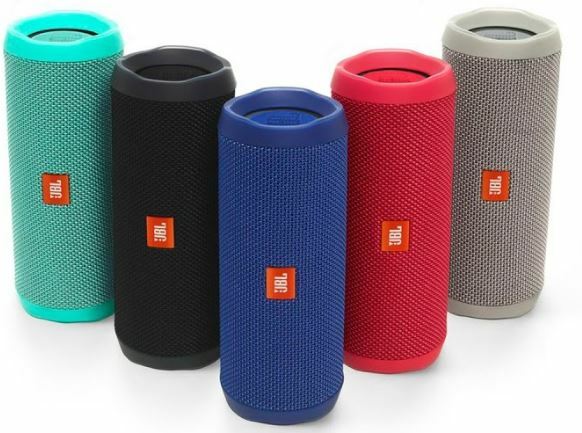 The JBL Flip 4 is a waterproof Bluetooth speaker which can be carried around easily. You can connect two wireless devices and play from one source at a time. The sound of the speaker is amazing and even a small sound played through it can be heard loud and clear. You get a pluggable USB 2 Bluetooth adapter with it. If you are using Windows device then it will work only with version 7 and above. You get this speaker in six colors – blue, black, grey, white, teal and red. 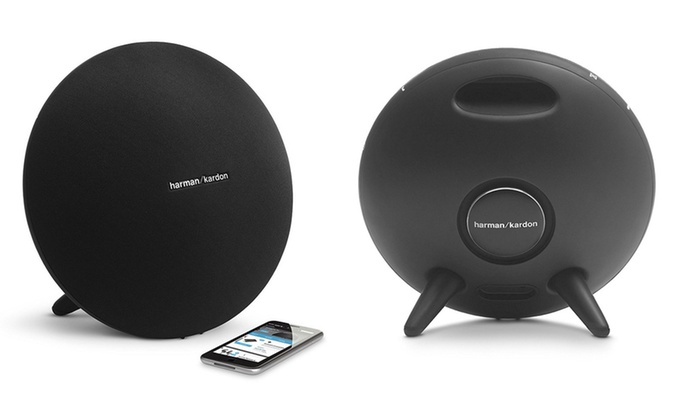 This speaker from Harman Kardon gives not only clear sound but an ecstatic feeling as well. 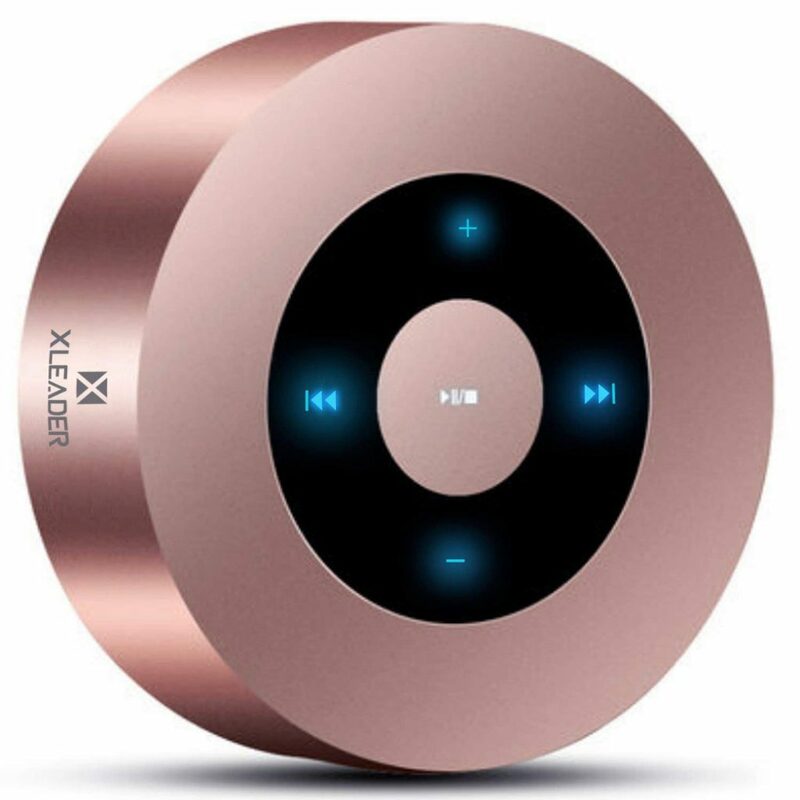 You can stream online music wirelessly and through Bluetooth and connect up to two smart devices together. Google Now or Siri can also be configured through the HK Connect App. It features a built-in microphone for a crystal clear sound. It happens to be one of the coolest Bluetooth speakers to buy in 2019. Enjoy crisp and clear sound with this speaker which is powered by dual ten-watt drivers. Bluetooth 4.0 lets you connect your tablet or smartphone up to a distance of 33 feet. The speaker connects to the last used device automatically when turned on. Its small size shouldn’t be mistaken for the quality of sound it offers. It features the MaxxBass technology and two passive sub-woofers that gives you an enhanced bass performance. The music played through it sounds perfect on both high and low notes. You can use the speaker without being tensed about it running out of energy as it has a 5200mAh lithium ion battery so you can play 125 songs continuously after a single charge. You get two colors in the speaker – black and white. The Bose SoundLink works in all directions so everyone experiences the same powerful sound. A flexible handle attached to its top lets you carry it anywhere comfortably. It features a powerful transducer so the sound is played at full range. There is a pressure trap placed in the speakers that eliminate any irritable noise so you get a flawless sound. It is also water resistant and you can take it around anywhere you want. Once charged completely the battery will last for 16 hours. The Charging Cradle lets you place the speaker above it for the charge while you listen to music simultaneously. This speaker from Bose is one of the best Bluetooth speakers to buy this year. You must consider various factors when you venture out to buy a Bluetooth speaker. For example, if audio transmission quality is your primary concern, opt for speakers with Bluetooth version 4 and higher. On the other hand, if the volume is what matters to you and you wish for loud volume, check out the size of the driver. The bigger the driver size, the louder will be the sound produced by the device. Those who want to use their Bluetooth devices outdoors can opt for rugged units that are waterproof and dustproof. These speakers on the list are some of the best Bluetooth speakers available at the moment. Users love them. Pick the one that suits your needs and enjoy clear sound and fantastic experience.